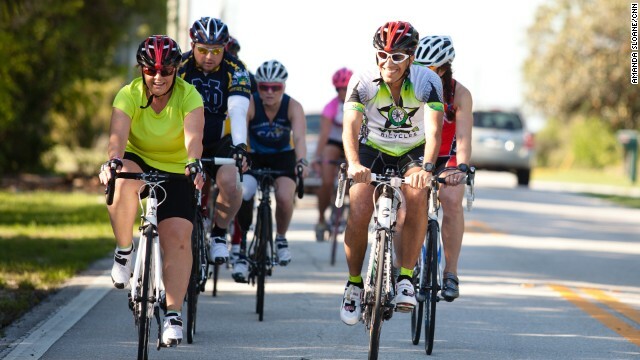 Rae Timme, left, and Dr. Sanjay Gupta lead the way for a CNN Fit Nation "6-Pack" bike ride. (CNN) -- Our CNN Fit Nation "6-Pack" was at the National Training Center in Clermont, Florida, this week for a halfway training trip. What's a "6-Pack"? Glad you asked. In January, six CNN viewers were selected to race the 2013 Nautica Malibu Triathlon on September 8 alongside CNN's Dr. Sanjay Gupta. Tabitha McMahon, Rae Timme, Annette Miller, Douglas Mogle, Will Cleveland and Stacy Mantooth are learning how to swim, bike and run like real triathletes. They've received equipment and training plans from coaches, and they're sharing their ups and downs along the way. Check out their progress on our interactive. Take a look at this week's intense activities through their eyes. If you are unable to see the Storify below, please click here.